Blizzard Midbus is the revamped version of Midbus, appearing in Mario & Luigi: Bowser's Inside Story and its remake. 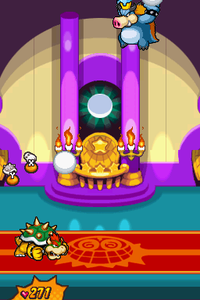 When Bowser meets with Midbus in Princess Peach's Castle, Fawful powers him up, changing him into Blizzard Midbus and giving him icy powers that serve as a parallel to Bowser's own fiery breath. In this form, Midbus is completely blue, with a brown, furry back. He also wears a crown, and is stronger than before, actually possessing the highest HP of any required boss in the game, exceeding even that of the final boss. 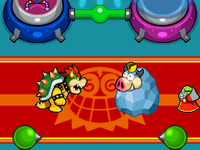 During the battle, Blizzard Midbus can use many ice-related attacks, several of which can give Bowser the Sick status. In one of his attacks, he can jump onto a colossal snowball and try to roll over Bowser with it. There is a Bob-omb sticking out of it which Bowser must punch to make the snowball explode. After Blizzard Midbus' HP is halved, he sometimes hides the Bob-omb so the player will have to remember where it is. Blizzard Midbus can also send Snawfuls out of his crown to attack Bowser. They can breathe icy mist at Blizzard Midbus, and for every Snawful that breathes icy mist on him, he recovers 30 HP and increases his defense. Bowser can inhale them, though, and allow Mario and Luigi to battle the small foes, and if they defeat five or more Snawfuls, then Bowser will spit out the icy mist they release from being defeated. The mist will freeze into an ice chunk that lands on top of Blizzard Midbus' crown, preventing him from releasing any more Snawfuls. Blizzard Midbus also attacks by using snowballs. If he looks at the snowball, he won't throw it at Bowser, but if he looks at Bowser before throwing it, it will go towards him. If Bowser can defend himself from three snowballs or more, Blizzard Midbus will attempt to do the sliding punch on him; it can be countered, as usual. Once again, he attacks by body slamming Bowser, but he does it differently this time around, as he requires some Snawfuls on the battle field to execute the attack. Blizzard Midbus will climb to the Top Screen and scale a wall. During this, Snawfuls will pelt Bowser with ice balls, so he must duck to avoid damage. After a few shots, Blizzard Midbus will bounce off a wall, and slam from above. Bowser must duck to damage him. Blizzard Midbus may also bounce off of two walls and slam in front of Bowser, so he must punch him to deal damage, but this attack will be tricky to defend against, since a Snawful will sometimes throw an ice ball at Bowser while Blizzard Midbus prepares to slam toward Bowser. Bowser's special attacks Broggy Bonker and Magikoopa Mob can cause a lot of damage to Blizzard Midbus. Blizzard Midbus, after being defeated. After Blizzard Midbus is defeated, he gets frozen in a gigantic block of ice, leaving only Fawful to contend with. He then begins pumping out an infinite stream of frosty gas from his snout. Bowser needs to use the gas to help the Mario Brothers progress inside his body. It's unknown what happened to Midbus after the events of the game, or if he even survived being frozen. This page was last edited on March 6, 2019, at 13:40.